We offer prompt, confidential service and reliable appraisals that conform to the Uniform Standards of Professional Appraisal Practice (USPAP) and satisfy all legal requirements, thus limiting your exposure and risk. Appraisals by Kennedy`s Auction Service, are recognized and accepted by Insurance Companies, Banks and Lenders, Courts and the Internal Revenue Service. ESTATE PLANNING: When preparing a will or living trust document, you will be required to make decisions about the dispersal of your personal property to heirs and beneficiaries. An appraisal of your personal property at this time will give you the information needed to make well-informed decisions about its distribution. This can minimize the possibility for future disagreements among your heirs by avoiding unequal distributions. ESTATE SETTLEMENT: An appraisal of personal property will often be required by the courts for estate tax purposes. It may also be needed by the Executor or Administrator to determine the value of personal property prior to distribution to the heirs. DIVORCE/PARTNERSHIPS: Many times an appraisal can assist in the equitable distribution of property in a divorce settlement or dissolution of a business partnership. INSURANCE COVERAGE/LOSS: Insurance companies will often require a written appraisal by a certified professional when writing an insurance policy for personal property, or when processing a claim for loss or damage. CHARITABLE CONTRIBUTIONS: The IRS may require an appraisal to substantiate the value of personal property for charitable contribution. It is always advisable to obtain an appraisal of donated items, so that both the donor and the recipient are aware of their value. PRIVATE SALE: An appraisal can assist you in determining the fair market value of antiques, art, or other valuable personal property prior to its sale. 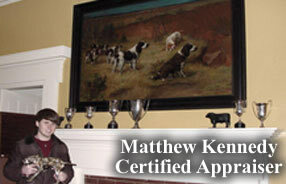 Kennedy`s Auction Service will meet with to discuss your appraisal needs and to provide you with a cost estimate. Most appraisals are billed on an hourly fee basis, based upon the time required to complete the appraisal, in accordance with the CAGA Code of Ethics. Single item appraisals are billed on a flat rate. You will receive a detailed, written appraisal report, including a listing and description of all property appraised. Digital Photographs are included in our reports with additional detailed photographs on accompanying CD if needed. 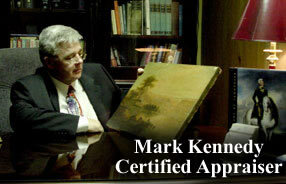 If necessary, Kennedy`s Auction Service can provide expert witness testimony in court. With members in all 50 US states and 6 Canadian Provinces, the Certified Appraisers Guild of America is North America's # 1 trainer of personal property appraisers. On an annual basis, it trains more personal property appraisers than any other organization in North America. The Certified Appraisers Guild of America (CAGA) is a professional accrediting organization providing certification of personal property appraisers. The Guild has been instrumental in helping to standardize the personal property appraisal profession. The members of the Certified Appraisers Guild form a network of valuable appraiser contacts throughout the United States and Canada. The Missouri Auction School established the Certified Appraisers Guild of America (CAGA). Founded in 1905, the Missouri Auction School has trained auctioneers in general appraisal principles. For over a century, it has provided personal property appraisal training as part of its curriculum. It has been recognized worldwide for its quality training programs by such organizations as Newsweek, The Wall Street Journal, Smithsonian Magazine, the Times of London, England and ABC, CBS, CNN and NBC news. Membership Requirements: Each member is required to attend professional training and pass a comprehensive exam before becoming certified. No one is allowed to be a member of the Certified Appraisers Guild of America without completing the certification program. There are no 'grandfathered' or 'associate' members that have not completed the training and exam. Each member has completed the course work required to be certified by the Guild. Educational-Standards: The training each member is required to complete, includes the uniform standards of personal property appraisal practice and appraisal report writing. Special areas of emphasis in training include Internal Revenue Service appraisal requirements, estate and gift appraisals, charitable donation appraisals, bankruptcy appraisals, insurance appraisals, appraisals for divorce, and casualty loss appraisals. Also presented during the two-day certification course is our courtroom expert witness seminar with special emphasis on appraisals for courts and testifying in court. Certification: The Certified Appraisers Guild of America confers the professional membership designation CAGA to recognize the completion of the appraiser's certification education. Members are professionals who have completed the certification process. In addition, the members have made a commitment to the Certified Appraisers Guild's Code of Professional Ethics and to the Uniform Standards of Professional Appraisal Practice. - The Appraiser shall obtain the relevant facts relating to the subject property to form the final conclusion of value. - All formal appraisal reports shall be in writing signed by the Appraiser. - The Appraiser shall disclose any interest in the subject property and will accept an appraisal assignment only if the appraisal can be performed without bias. - The Appraiser shall maintain the confidential nature of the appraisal report. The contents of the report shall not be disclosed without consent of the client or by court order. - The fee charged by the Appraiser shall be independent of the value in the report. - The Appraiser shall maintain respect for others in the appraisal profession. Questions? Call Kennedy's Auction Service at 731.645.5001 now!